Focaccia is a rustic Italian bread with just olive oil and herb toppings. But currently you can go for your choice of toppings and this make it less distinct than the ever popular pizza. But definitely there are differences between the pizza and focaccia. Focaccia is thicker than the thick crust/stuffed/whatever type pizza we order and this makes it more spongier. It also has more oil kneaded into the dough and then brushed on top whereas the pizza uses oil only on the top. Well, focaccia can be used a base of pizza also and unlike pizza can be served cold also. 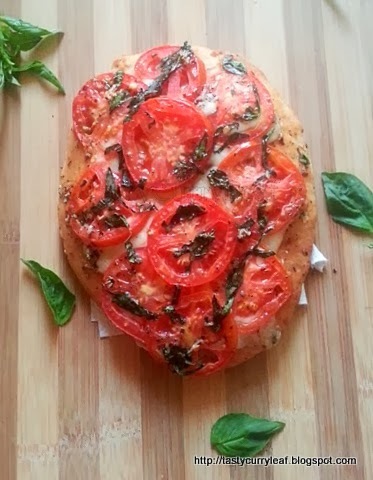 Thanks to We Knead toBake #13, I tried out Focaccia Caprese, which is a focaccia topped with caprese salad or tomato, mozarella and basil.I am a big fan of caprese salad as its very easy and loved it all the more atop the focaccia.I went for half the recipe and turned out 2 smaller focaccia which were polished off the same day by 3 of us. Make the herbed oil first by whisking together all the ingredients in a bowl.Keep aside. Put yeast, sugar, flour,salt and oil in a bowl and pulse a couple of times to mix well. Add 1/2 cup of warm water - start with 4 at a time -and knead until you have a soft elastic dough which little short of sticky. Shape it into a round and place in a well oiled bowl turning once to coat. Cover and let it rise almost double in volume for about an hour. Divide the dough into 2 equal portions. Roll out each portion evenly into 5" x 7". Odd shape is acceptable as it is a rustic bread. Transfer to baking sheet. The dough will shrink a little. Use fingers to push it out and make sure its evenly thick throughout. Let it rise for another 20 minutes. Lightly oil the fingertips and press into the dough creating dimples in it. Brush the surface with olive oil. bake in a preheated oven at 210c/410f for 18 to 20 minutes (mine took 18) till it starts to turn golden brown. Drizzle herbed oil over the focaccia bites and evenly arrange some slices of cheese over the bread,leaving little space between them. Arrange the tomato slices over this and sprinkle chopped basil. The topping should cover most of the surface of the bread. Drizzle more herbed oil and return to oven for 5 to 8 minutes until the cheese has melted. 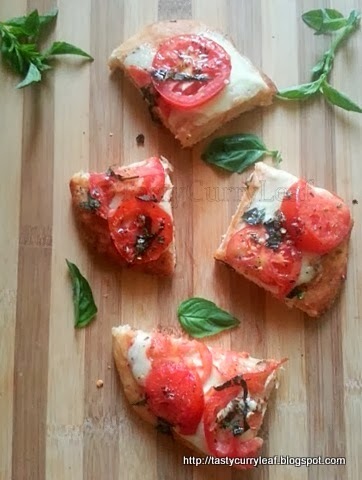 Remove from oven and garnish with fresh basil leaves.Slice and serve warm or room temperature. Perfecto. Next time I will try to replace the apf with whole wheat flour along with vital wheat gluten. Lets see how it turns out. Meanwhile have a sneak peak at Aparna's where she explains the difference between focaccia and pizza beautifully and who all enjoyed the focaccia.